Although a remake, POLICEGIRI brings back memories of DABANGG [Salman Khan] and SINGHAM [Ajay Devgn]. 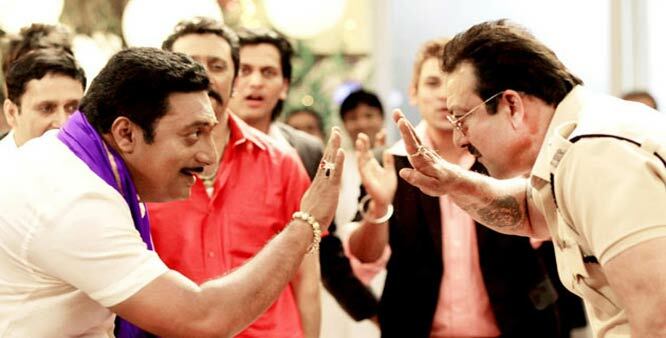 On the whole, POLICEGIRI is aimed at the single screen audience mainly. Like the above named films, the protagonist in POLICEGIRI is a cop, delivers thunderous dialogue, bashes up scoundrels like we swat flies and takes on the [corrupt] opponent in the closing stages. No prizes for guessing who wins! But the unfortunate part is, haven’t we visited similar themes in the past? What novelty does it offer? If you are a fan of Rajinikanth’s over-the-top action, if films like Wanted, Dabangg and Singham entertain you and if you like Sanju baba’s style, Policegiri is bound to make you whistle. Clearly catering to the masses and fans of masala potboilers, this Hindi remake of Tamil blockbuster Saamy (2003) has all the right ingredients, required to appeal to its audience. Bollywood’s fixation for formulaic cop films with south sensibility continues and if you don’t have an issue with it, you certainly won’t mind watching Policegiri. Dabangg is now officially a genre. Here are some of the salient features of the category and how Policegiri fits perfectly in. The film has to be about a cop. And he must be corrupt. Because you can’t fight the system unless you’re part of the system. I’m given to understand they’re putting this in school textbooks next year. Overall the objective of the genre is to show a common, “honest” policeman as a superhero. This only makes it harder for that other genre called “superhero”. This is to make films like Ra.One look average. If with one stomp of the boot, Baba can make cars fly, can Krrish do anything more impressive? On the whole, Policegiri is a routine action fare which has some chance among the masses mainly, but that won’t be enough to recover the investment in the film. Business in single-screen cinemas and smaller centres will be okay but that in the multiplexes and big cities will be way below the mark. Only here the experience is akin to watching one of those dubbed-in-Hindi South Indian films regularly aired on television headlined by a Bollywood mainstream hero. Policegiri was never expected to make sense but it’s the serious lack of charisma and the cringe it induces on seeing him romance an almost three decades younger Prachi Desai that spoils its chances even further. Plots with threadbare logic rely too much on larger-than-life heroics to draw its target audience in. But none of Dutt’s swagger is blustering enough to put up with a film as deafening, dowdy and drudging as Policegiri. For a film that is as spectacularly dumb, Policegiri makes far too much noise. The actors holler at the top of their voices, the action sequences are mind-numbingly silly, the background score can pierce through any cotton-wool shield, and the storyline is all sound and fury, and little else. Policegiri is veteran Tamil director KS Ravikumar’s first Hindi film. It better be the last. Policegiri is a remake of a decade-old Vikram starrer, Saamy. It draws inspiration from the likes of Dabangg and Singham. Sadly, Sanjay Dutt no longer possesses either the over-the-top swagger of a Salman Khan or the brooding presence of an Ajay Devgn. What’s Good: Sanjay Dutt. What’s Bad: Mostly everything else. Watch or Not? : Policegiri isn’t distasteful or bland; it’s just not refreshing enough. An overdo of beating baddies to the pulp, the film fails to match up to the level of Dabangg-like template in terms of coherent narration or zing! The plot is tiresome and the blaze exhausts itself by offering familiar power packed fights which lacks fun! After Salman Khan and Ajay Devgn indulged us in over-the-top superheroic cop movies, the aged Sanjay Dutt steps in to cash in on the mania.Armed with the mandatory aviators, a police uniform and a handful of punch-lines, Sanjay apes them earnestly. Unfortunately, his punch-and-the-baddies-will-fly routines and Munnabhai imitations aren’t novel and lacks punch to overturn the movie’s obvious ill-fate at the box-office.Policegiri’ shows glimpses of vintage Sanjay Dutt Yet, it doesn’t pack enough punch to warrant a trip to the cinemas.